Life today in the Greater Los Angeles and San Fernando Valley area can be more hectic than ever, and getting sick at just the wrong time is nobody's favorite thing. Fortunately, when you need the kind of personalized, high quality urgent care Sherman Oaks residents have every right to expect, but don't have the time or the energy to deal with it, there is an alternative. 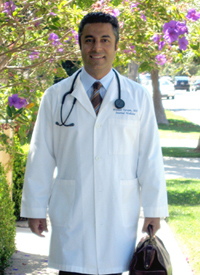 Contrary to popular belief medical house calls are not a thing of the past; board certified physician Dr. Michael Farzam of House Call Doctor Los Angeles has been providing outstanding care at the homes, offices, and hotels of patients on a 24/7 basis, and patients are universally pleased. When you're sick, you want to be able to relax and take it easy as much as possible. Driving through traffic to the kind of overcrowded health clinic Los Angeles inhabitants have come to associate with urgent care in Sherman Oaks and other bustling neighborhoods is, let's face it, the opposite of therapeutic. How much better, then, to avoid having to leave your home and await the arrival of first-rate house call doctor in the comfort of your own home or hotel room? In today's world it's only natural that cost is a concern for anyone thinking about urgent care. Sherman Oaks and Greater Los Angeles will be happy to know that Dr. Farzam's charges are far more reasonable than they may assume. In fact, compared to a visit to a standard emergency room, where patients may not be fully covered by insurance, Dr. Farzam's charges are extremely reasonable. For details and price schedules on the kind of first-rate urgent care Sherman Oaks, Tarzana, Encino, and all of Greater Los Angeles has come to expect from Dr. Michael Farzam, please call 310-849-7991 today or visit the House Call Doctor Los Angeles contact page.